American Wholesale Property: CLEAN 2009 BUILD! Minimal Rehab Needed! CLEAN 2009 BUILD! Minimal Rehab Needed! This is a great opportunity for an investor seeking an easy rehab with this property only needing cosmetic touch-ups and an A/C compressor. 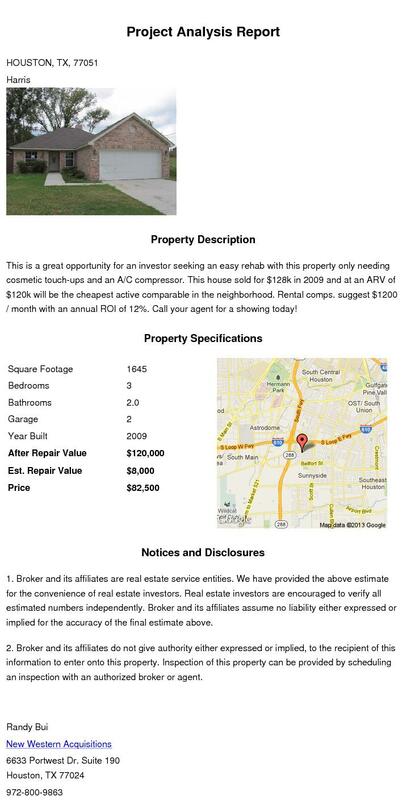 This house sold for $128k in 2009 and at an ARV of $120k will be the cheapest active comparable in the neighborhood. Rental comps. suggest $1200 / month with an annual ROI of 12%. Call Randy today at 972-800-9863!